Where to begin with Thomas Jefferson? 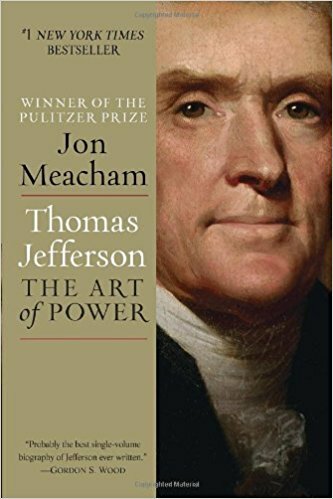 He is, as you'll often read, the perfect example of America's inherent contradictions: champion of the "self-evident" rights of man and human dignity, and at the same time, slave-owning "master of the mountain" at Monticello. He even advocated for the abolition of slavery all while never freeing his own slaves in his lifetime. But Jefferson's contradictory nature didn't end there. He was also the self-styled promoter of limited government and states rights while, as President, engineering the Louisiana Purchase, which doubled the size of the country and added $15 million (a lot in those days) to the Federal deficit. He often acted as if he was above politics, yet he founded the nation's first political party. And though he was, in many ways, a strict constructionist, he had no problem exerting muscular executive power when he saw the opportunity to benefit the nation he loved. What I found particularly disappointing was how the ideology that was so central to the making of the nation in its infancy, namely republicanism and egalitarianism, became radicalized in Jefferson later in life, exemplified in his unwavering support for an increasingly violent Jacobinical France. On the other hand, the Republican accusations of nascent monarchism in the views, public statements and policies of the Federalists were, at times, justified as well. Even though Jefferson's Republicans came to rule the political scene in America, eventually without challenge, the influence of Hamilton and his Federalists was in important check as their ideas for a central bank, strong executive power, and an economy based on modern commerce and manufacturing came to fruition only after Republican instransigence on those matters cost the young republic dearly. Still, his influence was immense, his genius in no doubt. Jefferson in many ways, feels more human than many of the early founders. He was endlessly curious, and cultivated incredible amounts of knowledge regarding subjects far and wide. He was also quirky, given to moments of incredible nativity and flights of fancy. For instance, he latched on to the bizarre idea that future generations shouldn't be subject to the laws of previous generations and so the Constitution should expire every 19 years. Madison wrote him back, basically saying, "yeah...ummm...interesting? But probably not practical, boss." As for Meacham's book, I found it enjoyable, yet oddly matter-of-fact. It seems to plug along at a brisk enough pace, moving from event to event, fact to fact, but lacked the narrative drama that makes McCullough or Ellis so consistently enjoyable to read. The kind of attribute I'm missing here works best when not overplayed. I'm certainly not asking for embellishment or overwrought stylistic devices. But it seemed to me, at times, Meacham could have made more of an effort to reflect and contextualize before moving on to the next career highlight. With his brilliance and his accomplishment and his fame he is immortal. Yet because of his flaws and his failures he strikes us as mortal, too—a man of achievement who was nonetheless susceptible to the temptations and compromises that ensnare all of us. He was not all he could be. But no politician—no human being—ever is.